I hired a small boat for a view that didn’t include me endlessly bumping along dirt roads. 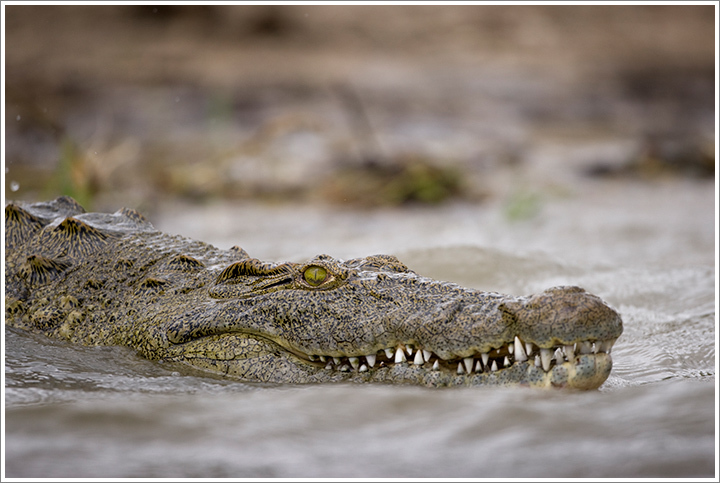 We spotted a massive Nile Crocodile (Crocodylus niloticus) sliding into the muddy water of the Chobe River in Botswana’s Chobe National Park near Kasane. And suddenly the relative security of the truck didn’t seem so bad. Photographed with a Canon EOS-1D Mark III camera and 600mm f/4 lens. Exposure 1/1600 at f4. This entry was posted on Saturday, January 19th, 2008 at 8:14 am. It is filed under On the Road and tagged with Africa, Botswana, Chobe National Park, Crocodiles, Wildlife. You can follow any responses to this entry through the RSS 2.0 feed.